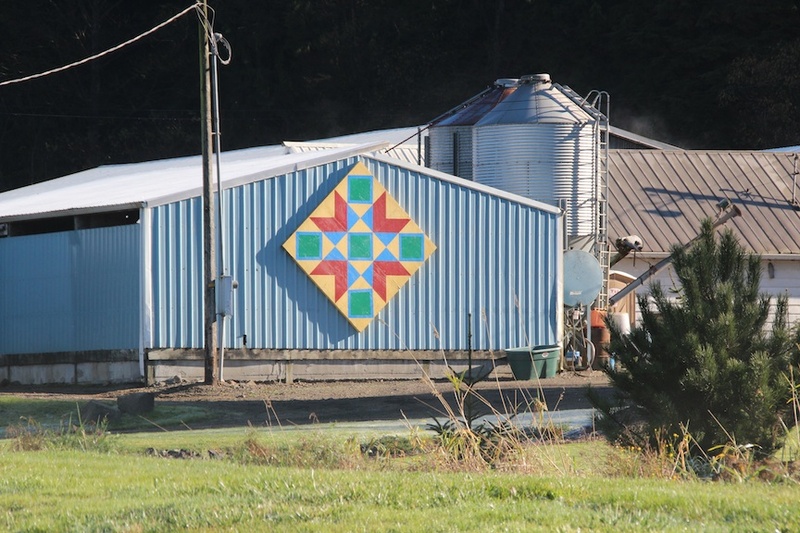 There are many barns and other businesses in the nearby town of Tillamook, Oregon (famous for cheese, and yes we toured the Tillamook Cheese Factory too) that have these colorful quilt pattern squares on them. 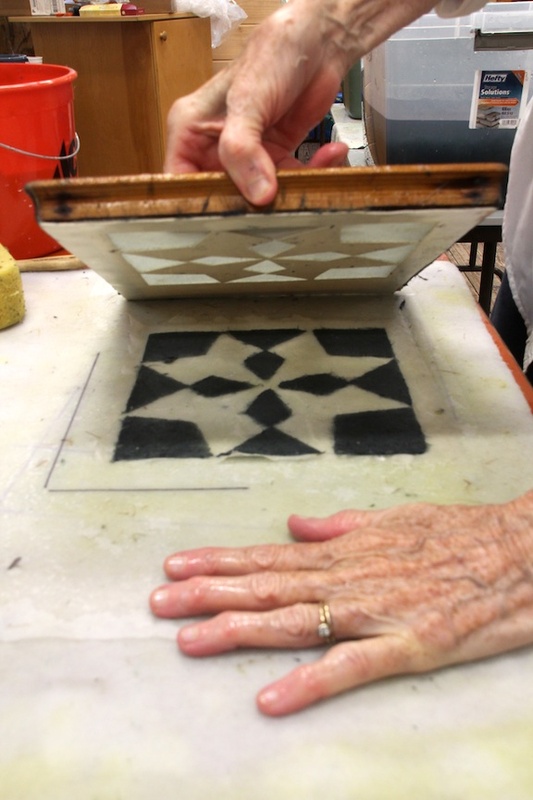 Each barn has a different pattern and makes a trail for tourists to follow in the area. Sitka Center is located at the very southern edge of Taillamook County and actually closer to Lincoln City, Oregon, in Lincoln County, but Tillamook is an interesting place to visit about 29 miles north on the coast. 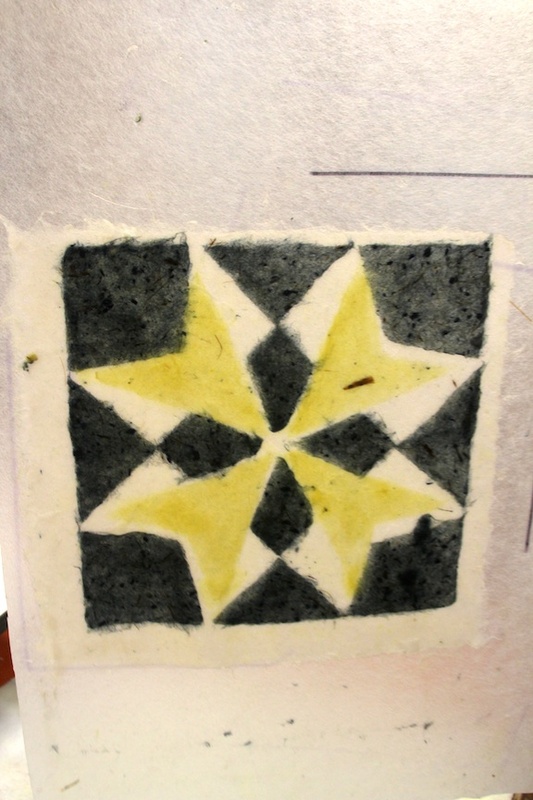 Since I am from Alabama and all my female ancestors were quilters, I am familiar with quilting patterns and wanted to try and this with handmade paper. 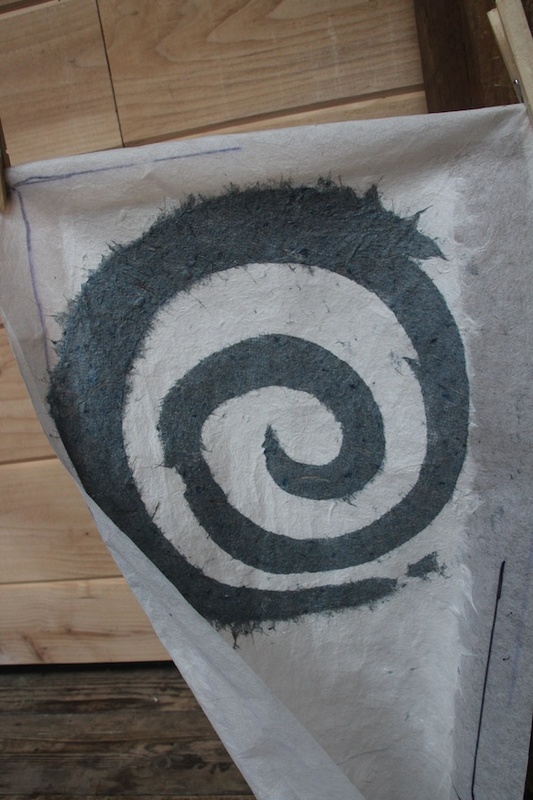 I started making a new series of handmade paper quilts. 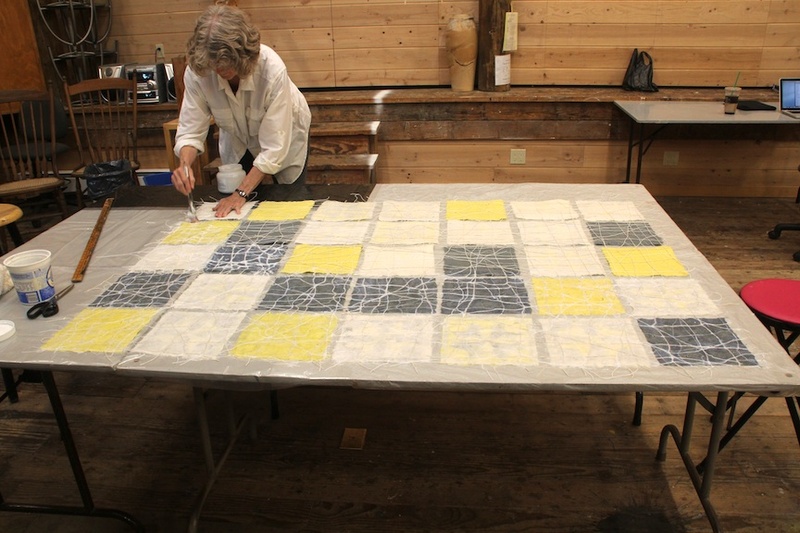 Here are some photos of the first quilt and how it was created. 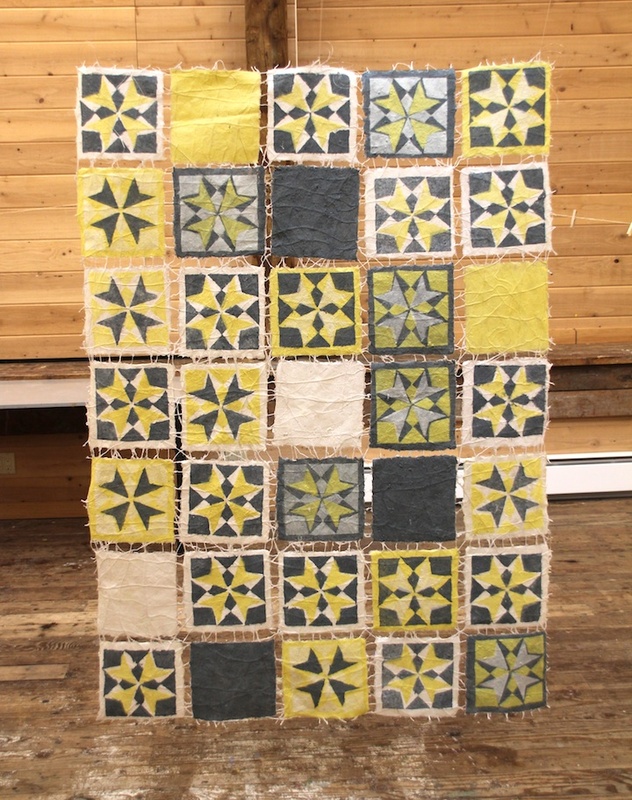 I used “buttercut” stencils on three different moulds to make the quilt squares and played around with the order and color sequences. I joined the handmade paper quilt squares with thread glueing it with acrylic soft gel matte in my usual way so that the quilt can fold up for easy storage and transport. 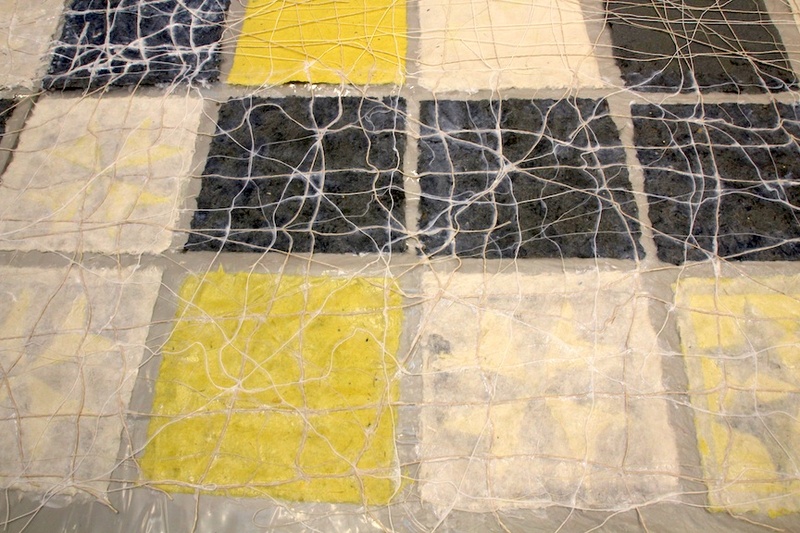 It is interesting to hang this quilt in space with the light coming through and see the threads that sew this quilt together and how they contribute to the layered look. 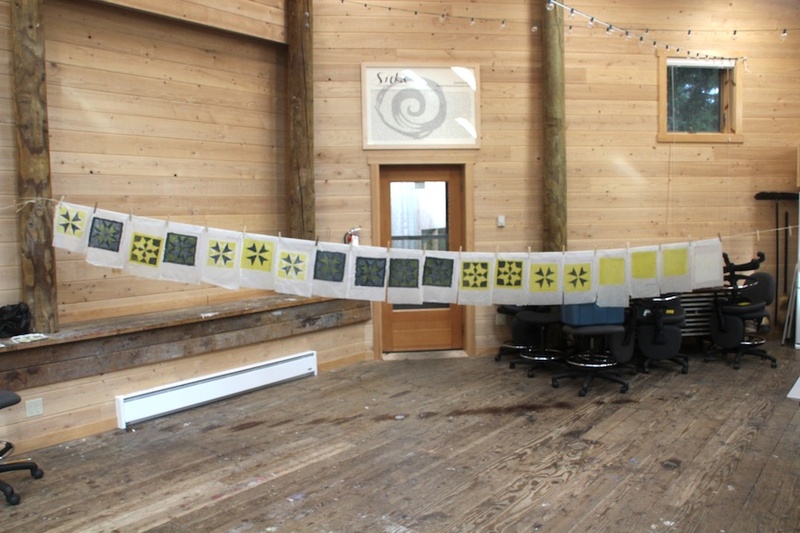 The Boyden Studio at Sitka Center for Art & Ecology (www.sitkacenter.org) where I am lucky to be working during this residency is a wonderful big and light-filled space. 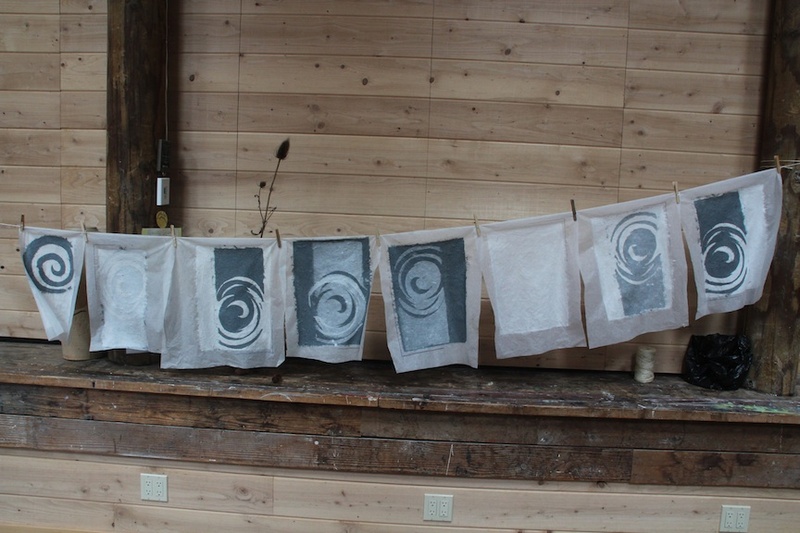 Check back later for more updates on my 3-month artist-in-residency at Sitka Center from Oct. 16 – Jan. 10. 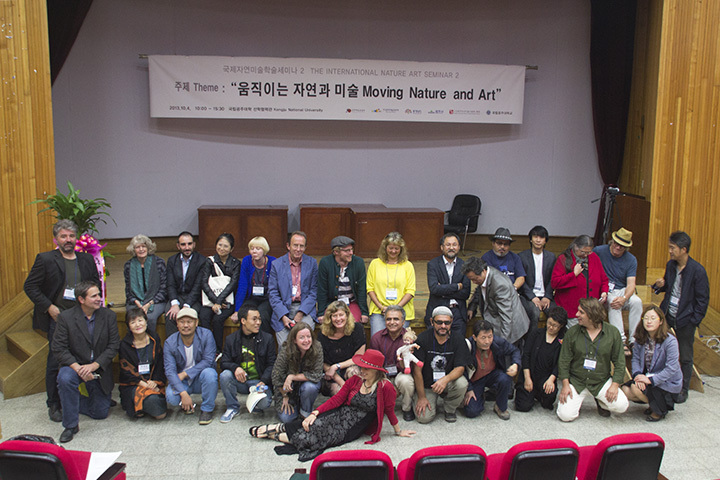 My Article about International Nature Art Curator’s Conference in Korea Published! Here is the email from the Art Radar Editor about the publishing today of my article about the International Nature Art Curator’s conference in Korea where I spoke in early October about the Cheng Long Wetlands International Environmental Art Project in Taiwan. Please also send this link to others who may be interested. 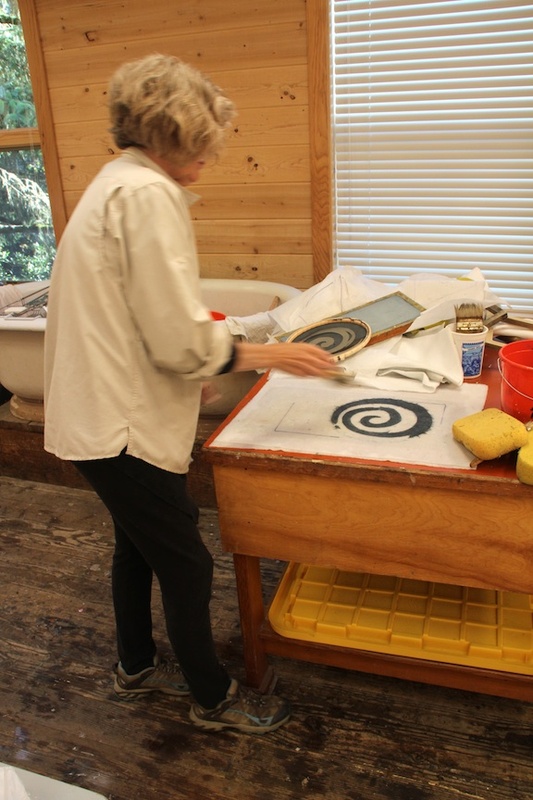 I was awarded an artist-in-residence at Sitka Center for Art & Ecology in Otis, Oregon, from October 16, 2013 to January 10, 2014. 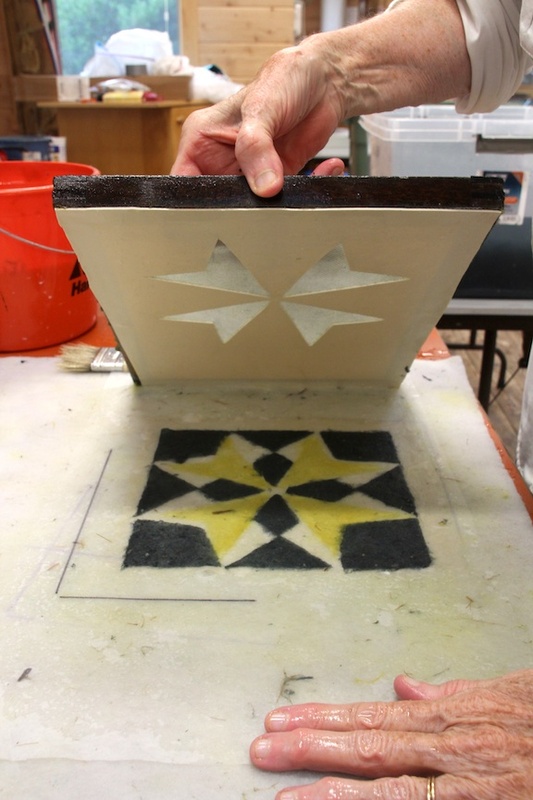 The Sitka Center is located in the northwestern part of Oregon on the coast just above Lincoln City. It is a beautiful area, and Sitka Center is part of the Cascade Head National Scenic Research Area. They have wonderful studios and small cabins for the residents here. We are living amidst tall Sitka Spruce trees and also able to see the ocean where the Salmon River runs into the sea. There are many elk here we are told – haven’t seen one up close yet but I have seen a big herd of elk far up on the mountainside. 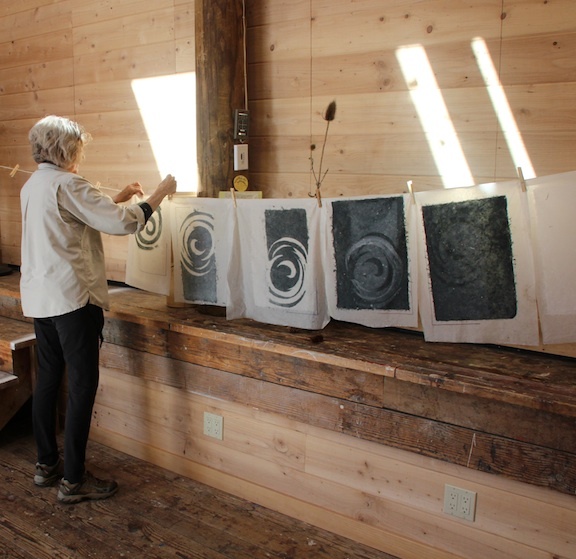 I am having a great time making my handmade paper art in the big and light-filled Boyden Studio at Sitka Center. This studio has great facilities for a papermaking with a huge bathtub sink, stove and lots of tables and also a high ceiling for my suspended installations. 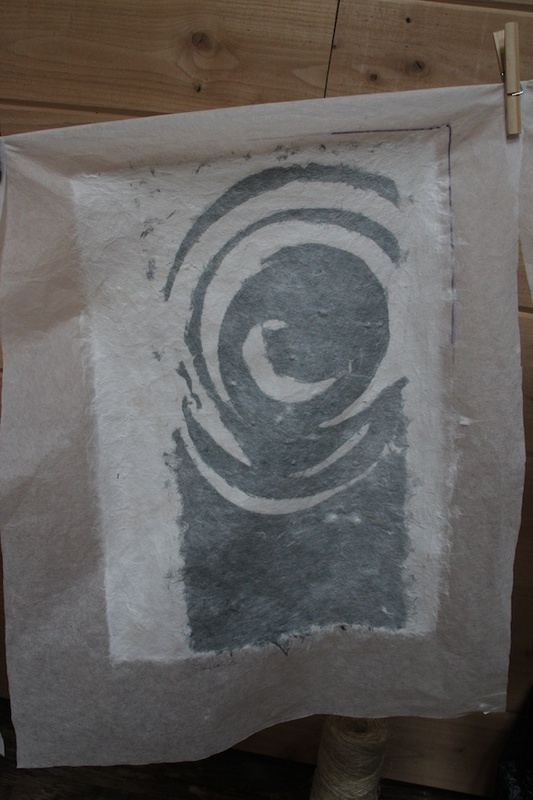 One of the things I started when I first arrived here was making paper with some pulp I brought with me, kozo and blue jean pulp. 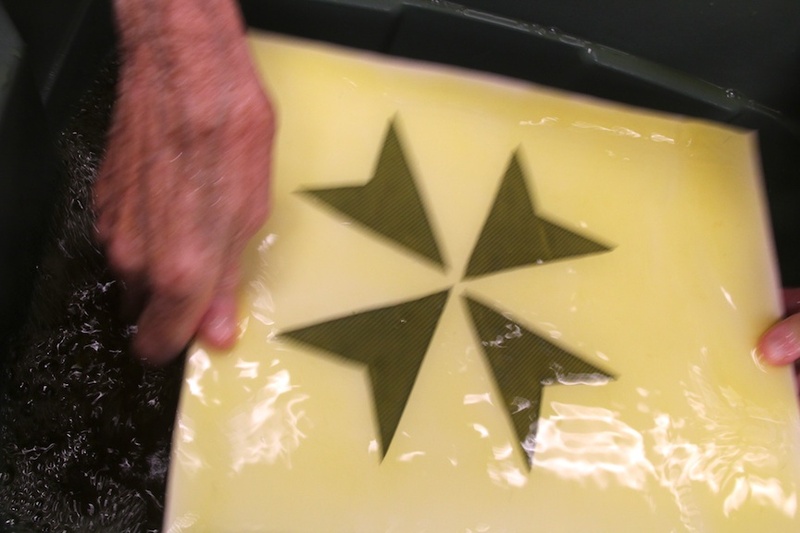 I noticed the Sitka logo form that is on all the signs around here. 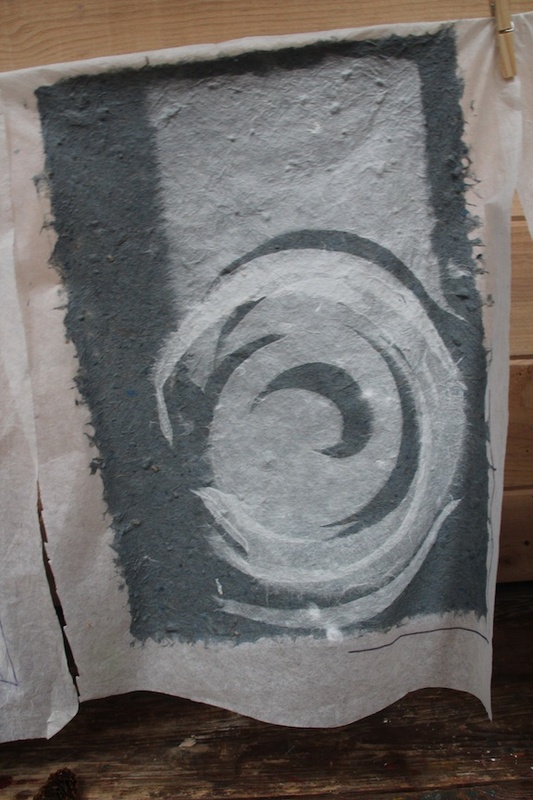 So, I decided to make some handmade paper that was inspired by the Sitka logo, a spiral form, that reminds me of the ocean, the wind and waves. 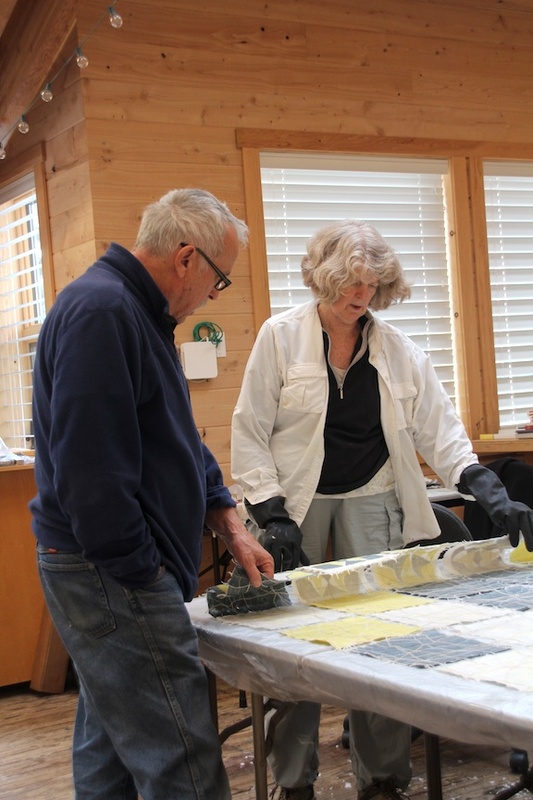 A poet Tom Crawford, also a resident artist here now, and I may collaborate with a calligrapher to put one of his Sitka inspired poems on some of my handmade paper. 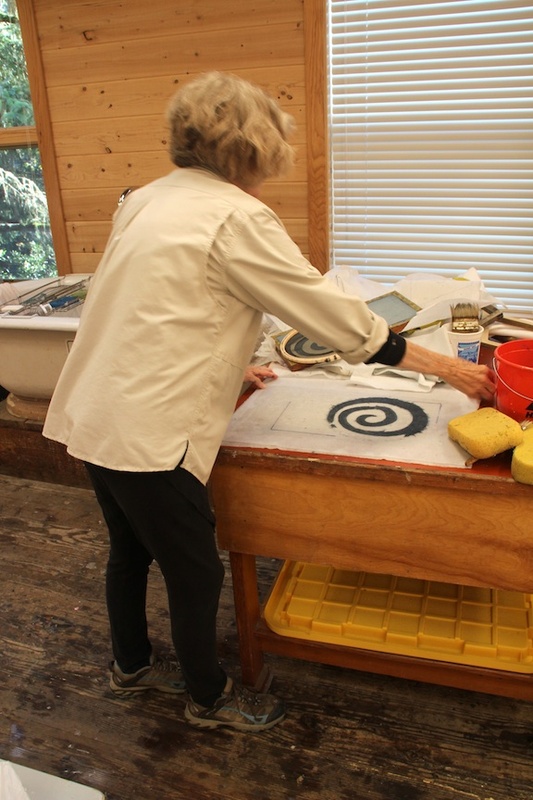 Here are some photos of me working in the Sitka Center studio and making the Sitka Center symbol-inspired handmade paper. 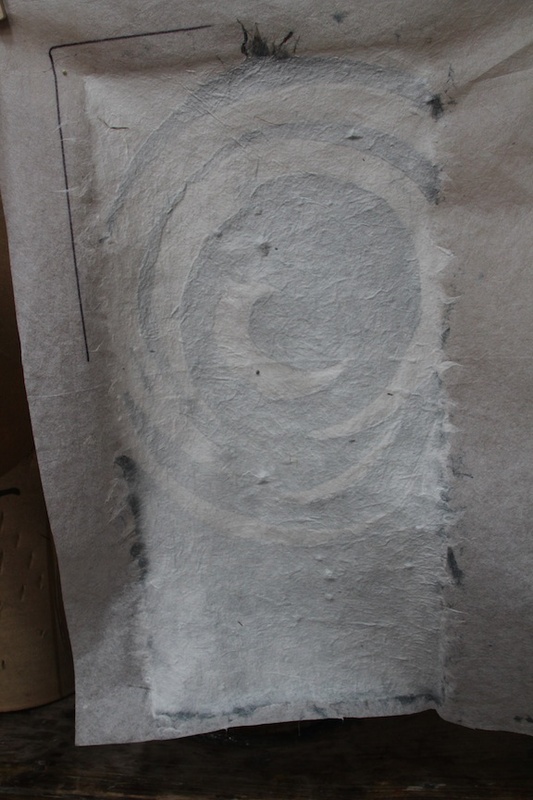 I am drying the paper on sheets of non-woven interfacing, and I used buttercut to make the spiral stencil on a round embroidery hoop frame with ordinary fiberglass window screening on it. 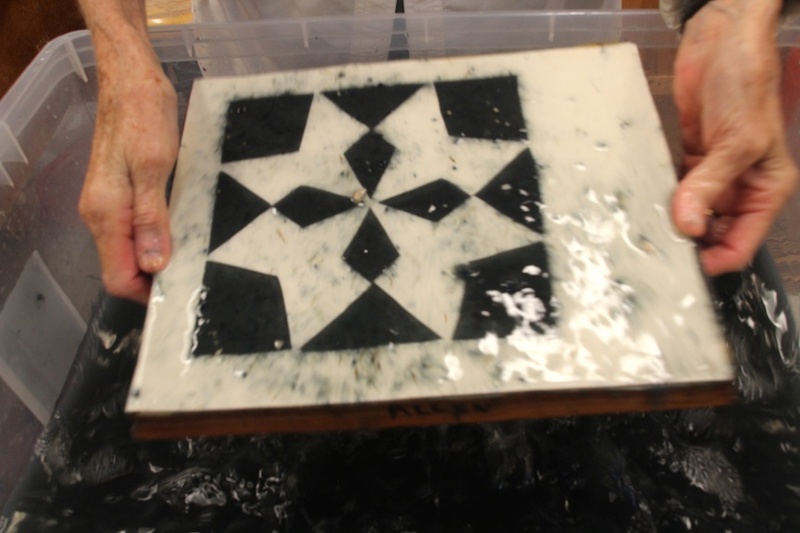 I am also making paper from plant materials collected here for a Sitka site map and other works I am planning. 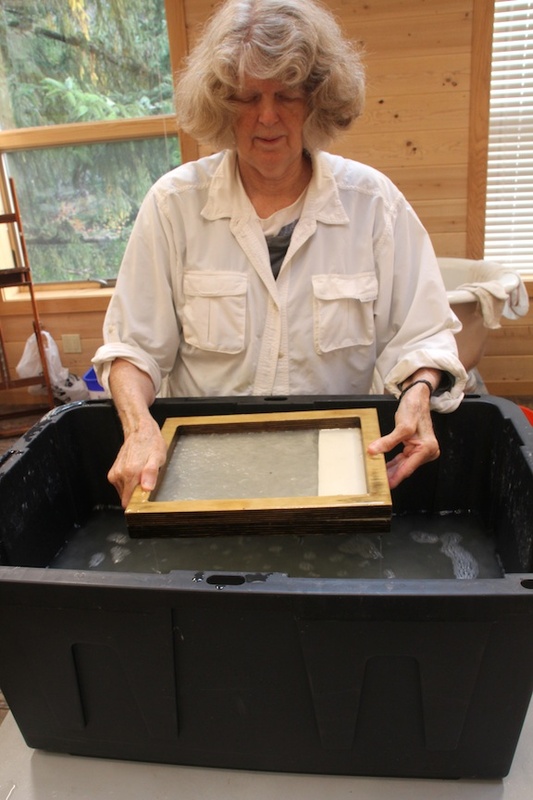 I have made paper from 3 plants so far and have 3 others gathered and ready to cook up and make pulp. I will keep posting here with news about the results from the Sitka plants and the new artworks I am making.